The powers that be in the marketing business are always looking for another angle to tourism on the Costa del Sol. Every year lots of money and hours are spent on dreaming up new themes to entice more and more holidaymakers to the coastline in Malaga province. Not an easy task in one of Europe’s favourite holiday destinations where practically every single resort has lots of beaches, guaranteed sunshine, prime golf, plenty of shopping, theme parks… Lightbulb moments for new angles are few and far between, but it’s important to stand out. Malaga city has recently rebranded itself City of Museums. Marbella has always gone for the high-end market with its luxury labelling. Benalmadena promotes a family-friendly image. Torremolinos has carved something of a LGBT niche. Estepona has turned to nature. And that’s big time. 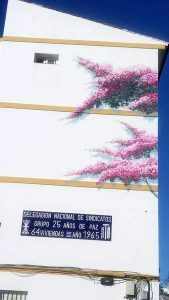 Branding itself the “Garden of the Costa del Sol”, the resort has taken plants and trees as its central theme with art in the form of murals, sculpture and poetry as 3 powerful sidekicks. In mid-April a group of writers and journalists from the Costa Press Club were taken on a guided tour of Estepona. Curious to see this new take on tourism on the Costa del Sol, we got an insight into the town’s new look, its new raison d’être and the results. Guided by the head of Estepona’s tourism strategy Aleksandra Broch, we started at the Orchidarium before exploring the streets and squares. We then finished at Casa del Rey, a restaurant example of how Estepona has moved with the times. I’m a big fan of orchids so this has been on my must-visit list since it opened. I wasn’t disappointed, although there weren’t many orchids in bloom when we visited. However, but the building itself is extraordinary. 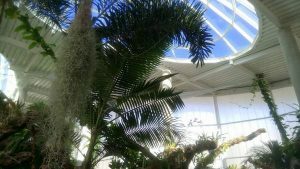 It must be the largest hothouse in southern Spain – the two glass domes are truly impressive as is the cascade. Add to this the very pretty gardens outside – recently named after Carmen Thyssen, the fine art collector (a sizeable part of her collection is on display in Malaga) – and this is a very worthy tourist attraction. And more importantly, it’s unique. 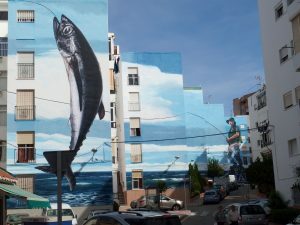 Estepona has been building up its mural collection for several years. 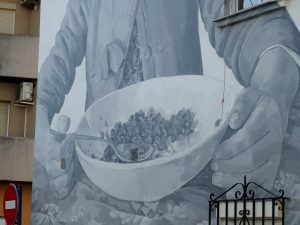 We visited a while ago when there are around 25 murals on façades throughout the town. In early 2018, there were over 50. Broch explained that the idea behind the murals is to brighten up drab or uninteresting parts of the town. This seems to have worked. The housing around the Orchidarium, all social housing from the 50s, looks much better with its floral-based murals. Ditto the stunning mural (Spain’s largest) just a block away. In its bid to differentiate itself from the mainstream tourism on the Costa del Sol, Estepona has also embraced poetry. The Poetry Route takes in pieces of poetry in different languages at a total of 29 locations with the town. We particularly like Poets’ Square, a once rather indifferent corner that is now home to several busts of illustrious Spanish poets. Art in Estepona doesn’t stop at murals and poetry. Sculpture too shares centre stage – over 30 pieces sit at different locations around the town. Again, quite unlike anything else on the Costa del Sol. 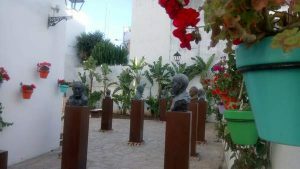 Estepona has 2 mural walks, a sculpture stroll and a poetry route. Leaflets together with a useful map are available at the tourist office on Plaza de las Flores. Each street in the town centre comes decked with flower pots, all a different colour and planted with geraniums. According to Broch, the streets are now known by their flower pot colour – green spots, purple, brown… rather than their actual name. Along with the pots, many streets have been pedestrianised – a huge improvement if you’re a tourist. We encountered hardly any traffic on our tour and the peace and quiet was enviable. The streets have also had an infrastructure revamp – new pipes for utility supplies, new pavements and new road surfaces. Add to this, no less than 1 million plants and you’ve got a very pretty place. As José María García Urbano, the Mayor, explained to us later, in its bid to stay ahead in the tourism game Estepona has adopted a unique approach. He summed it up as “saber hacer y hacer saber” in Spanish, which basically means “know how to do something and make sure others know why you’re doing it”. In English it isn’t nearly as neat but you get the idea. Both he and Broch reiterated how consensus is reached with all residents on the pedestrianisation, the flower pots and the murals. Everyone is made aware of the changes and their potential benefits. No mean feat in a world where everyone wants à la carte everything. So, what do 50 murals, 29 poems, 31 sculptures, 1 million plants, hundreds of plant pots and shiny new traffic-free streets add up to and actually create? Broch cited multiple benefits. Estepona is currently the Costa del Sol resort attracting most new property investment – according to her figures, some 40% of development is taking place in the town. Obviously the town’s aesthetic appeal makes it a des-res but so do efficient planning procedures and plenty of available building land. Unemployment has reportedly dropped considerably. No figures were provided but a quick look at the statistics shows that Estepona had a jobless rate of 19.4% in February this year, on a par with other Costa del Sol resorts such as Marbella and Fuengirola. This is some 5 points below the provincial rate. New businesses are arriving on the back of the Garden of the Costa del Sol’s appeal. Several new restaurants have opened in the town centre where 8 hotels are also under construction. We also noticed what looked like new boutiques in several locations. García Urbano said Estepona’s medium term aim isn’t to grow, but to improve. Both he and Broch cited several big projects underway on the town’s outskirts including some ambitious sporting facilities. 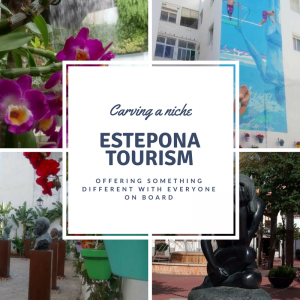 Once something of a backwater, Estepona is aiming high in its bid for a chunk of tourism on the Costa del Sol. Note: On behalf of the Costa Press Club, I would like to thank Estepona council for their interest and help in our visit and Casa del Rey for providing excellent pinchos and divine wine along with great service. Between them, they did an excellent job of promoting their town and of giving us all an excuse to return. Which is, of course, what successful tourism marketing is all about.